Lightning fast acceleration and sensational power, combined with incredibly low emissions and fuel consumption – here’s why supercars are getting plugged in. For some, just having a hybrid is simply not enough – a plug-in is needed. We’re talking about extreme sport cars and ultra luxury sedans, now condemned to be plugged into an outlet in order to avoid the risk of extinction due to future caps on CO2 emissions. In reality, rather than out of purely technical considerations, the choice of the plug-in is born out of a careful reading of the regulations in the West, which blatantly favour this solution. For example, the CO2 emission caused by the recharging of the batteries is measured as zero – despite the fact that, according to the international energy agency, European power stations emit an average of 250g per kWh produced. In addition, the regulations do not keep account of the fact that, at the end of the test, the batteries are discharged and therefore need to be recharged. Thanks to the superior efficiency of an internal combustion engine, coupled with an electric motor, plug-in cars consume very little – at least during the approval tests! Incredibly low consumption levels are also registered for models with outrageous horsepower and sensational performance – like the three featured here. We must consider that in supercars it’s more manageable to introduce expensive new technology – for obvious reasons. It’s another thing altogether to make it stick in models destined for the masses, like the Toyota Prius or the Audi A3 e-tron (which will arrive in the autumn of 2014). What is true, nonetheless, is that the batteries truly allow these machines to be two cars in one – an electric one, with sufficient range in the city, and a hybrid for longer trips. Moreover, more powerful plug-in engines can be adopted, which help the thermal engine with instantaneous torque – as a result, ensuring better performance despite the additional weight due to the electric components. this is how the E-hybrid version from Stuttgart introduces itself. The days of the Panamera hybrid are over. From now on, the range will only include the E-Hybrid plug-in, which allows the batteries to be recharged through the electricity network, and boasts a maximum electrical range of 36 kilometres. The approved consumption figure is 33km/l, and the performance figures are as impressive – with 590Nm of torque at 1,250-4000rpm, and 410bhp. Of this total, 329bhp and 440Nm are produced by the 3.0 V6 supercharged petrol engine. The vehicle’s plug-in system will be used on other Porsches as well – first on the Cayenne, and then on the next generation Bentley’s. The engine, and electric-clutch (to disconnect the petrol engine from the wheels), will also likely be paired with the PDK dual-clutch transmission, in addition to the current 8-speed torque converter automatic. Next to the shift lever are the mode-selection switches. By pressing E-charge on the highway, the V6 recharges its batteries in 30 minutes. By selecting E-power, the Panamera reaches 135km/h through the exclusive use of electric mode, while in normal mode it becomes a hybrid that automatically selects the functioning of the clutch, transmission, the petrol V6, and the electric engines. Lastly, by selecting Sport mode, the electric engine powers the car in sync with the V6 – producing a powerful boost effect. On one hand, there is monster performance, while on the other there are minimal emissions – at least during testing. These are the two faces of Porsche’s 918 Spyder. The 918 has three engines – one is a 600bhp 4.6 litre petrol V8, while the other two are electric (one in the front, the other at the back), and together they deliver an additional 282bhp. The batteries, with 321 Lithium-ion cells (cooled by an independent liquid circuit to make them work between 20 and 45°C), store 6.8 kWh and deliver up to 220kW for a few seconds. There are five driving modes, which the driver can set by way of a switch on the steering wheel. On E-power, you can travel up to 30 kilometres on electric mode (much less if you’re doing 0-100 in 7 seconds and 150km/h on the highway on electric power alone), while in Hybrid mode the control unit automatically selects which of the three engines to activate in order to keep fuel consumption at the lowest possible level. If, while in Sport hybrid mode, the V8 stays on all the time and supplies the better part of the thrust, when on Race Hybrid it energetically recharges the batteries anytime max power is not required so that the batteries are always able to power the two electric engines during acceleration. The fifth mode, called Hot Lap, takes this functioning to the extreme as it squeezes the batteries and the two electric engines to the limit for maximum performance. The new ‘plug-in’ McLaren is extremely sophisticated in order to hit the track hard, as well as provide the ease of everyday driving. Let it run loose in the city on electric E mode (with a maximum battery range of up to 10 kilometres), and then drive it all the way to the racetrack. 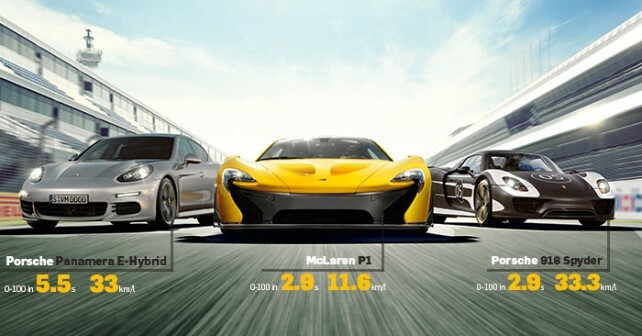 Once there, select the Track or Race mode, which adjust the engine, gearbox, aerodynamics, and the active suspension, so as to exploit the maximum potential from the 916bhp P1 (737 of those come from the twin-turbo V8 engine). At Woking, McLaren’s home base, this is how they foresee using the P1. The development of the car received contributions from Italian Carlo Della Casa, while another Italian, Claudio Santoni, designed the carbon frame – a jewel of lightness – original both in terms of engineering solutions (such as the ‘co-laminated’ roof), and with regards to the use of composite material even lighter than those currently on the market. Even the tyres come from Italy, developed by Pirelli. Of particular sophistication is the P1’s suspension – hydropneumatic and active, it manages roll and the suspension independently, while also controlling the height from the ground. Naturally, the shock absorbers are also adaptive. All four wheels are controlled independently, each one with its own actuator –including pistons that act on two separate circuits, and which, respectively, contrast the roll and control the vertical movements. The anti-roll bars and the classic steel coil springs have been eliminated in this setup. The P1 features 4 settings for the suspension – Normal, Sport, Racetrack, and Race. The first three are selected on a mini-handle, while the fourth is button-activated. Between the Normal and Race mode, the roll rigidity increases by 3.5 times, while that of the suspensions increases by 1.4.